Every baby needs to be wrapped in love and prayers, especially when that baby is born too soon. I had the privilege of making a gown for a tiny boy, born long before he was due. We often stitch Wee Care gowns with no particular baby in mind. That in and of itself is a gift and as I said, a privilege. Like every Wee Care gown for me, every stitch is a prayer. That gift is even greater when you have a a certain baby in mind. 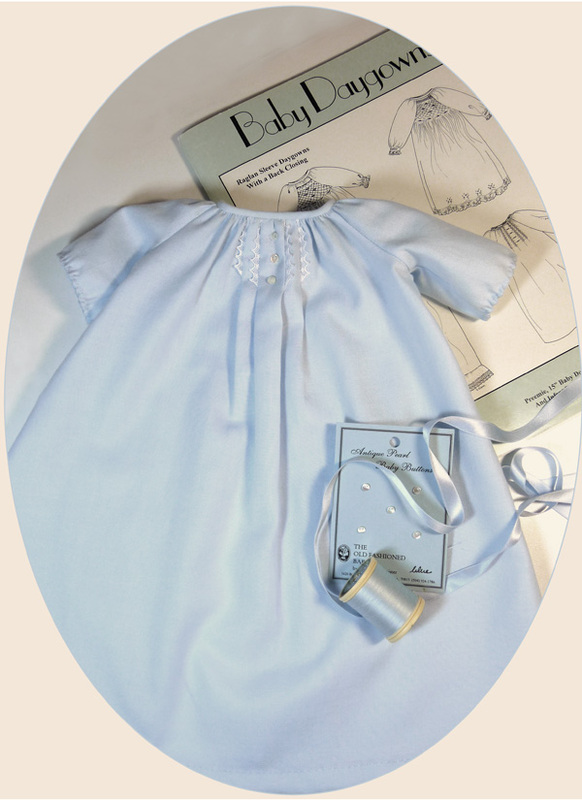 As I finished this little gown, I offered many, many prayers for both he and his sweet mommy. I used Swiss flannel, which is a yummy fabric. So soft. 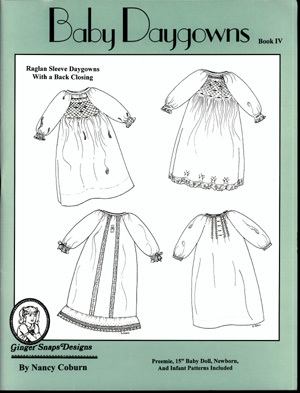 The pattern I used was Book IV of Ginger Snaps Daygown series. I used the view that has four tucks on the front. I wish I knew where I had purchased the "pointy" lace I used. Very manly for a tiny gentleman. Down the center are three of my favorites, sequin buttons. For the sleeve hems, I used a shell stitch again. It gives it a special touch without using lace. Good news, I hear this tiny little man is doing really well. Growing just like he should. Prayers answered. Don't ever pass up the opportunity to stitch a Wee Care gown, whether it is for someone you know or a baby and his family you may never meet. You will be blessed as will they. 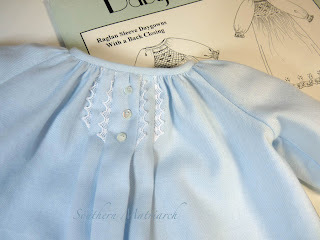 What a lovely post about stitching a gown for a precious gift that arrived a bit too soon. I like the shell stitch on the sleeve hems, it seems to be a good finish for such a tiny gown. I'm going on vacation in a few weeks, I'll dig out my Wee Care gowns that have been languishing in my sewing room and work on them. They are great for airplanes, and many of the passengers ask about them! so precious and just right for that sweet boy. I am so glad that he is doing well. I will say a prayer for him and his family! 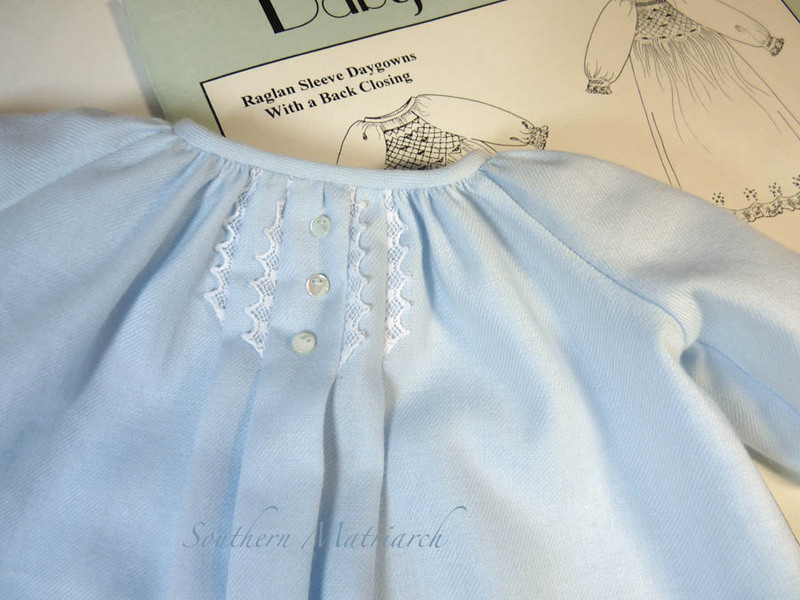 What a lovely little boy's daygown! I am sure that his parents will love it on their sweet tiny bundle. Soooooo glad that he is doing well! Praise God! I'll keep this little guy and his family in my prayers. So sweet !! I'm assumimg it's for baby Cleve, I hope he outgrows it very quickly. What a sweet gown for a sweet baby boy. Just saw the pic of the little one wearing this gown. So sweet! I love this pattern. It's one of my favorites. Thank you for posting this gown. I have been making Wee Care gowns and it is hard to get the bishop pattern made up for a boy. I wanted something not as girlie and this gown seems perfect. The Help..Have You Seen It?